I have a brand new sponsor to share with you today. You know how I feel about sharing brand new little shops. It’s like I’m sharing a little secret. Heidi, from Honeybear Lane, is a mom with a passion for crafting. She spends a lot of her crafting time sewing and especially loves making items for children. And that’s exactly what I’m going to show you today… Some of the sweetest items for the little ones. 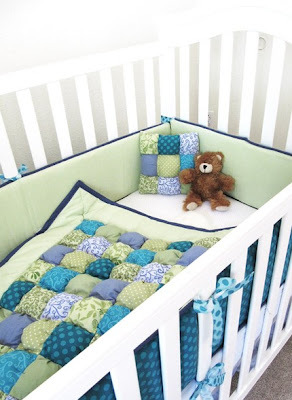 So first, I have to show you these darling little puff baby quilts found here. Each quilt is made by Heidi, piece by piece, with lots of love and patience. Look at that little quilt, all snuggled in the baby’s crib. Heidi offers a variety of color combos and has a great eye for combining colors and textures. Just look at all of those little puffs. 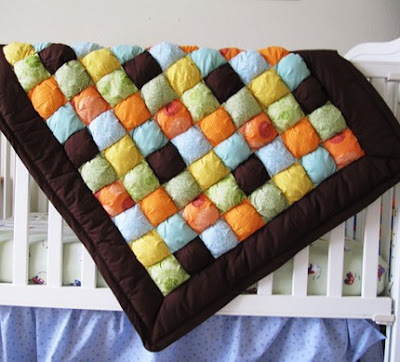 What a great textured blanket for babies to begin exploring on. 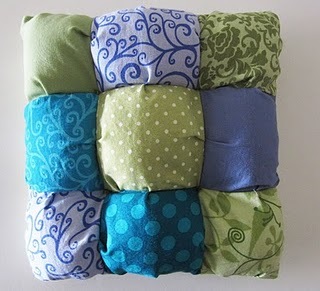 Heidi is also very willing to create custom puff quilts, so don’t be shy to request the exact color combos you’d like. She even offers great little color palette’s showing you some of the color combos that will work, and then you can narrow it down to the exact colors you’d like. Ahhh, what a time saver! 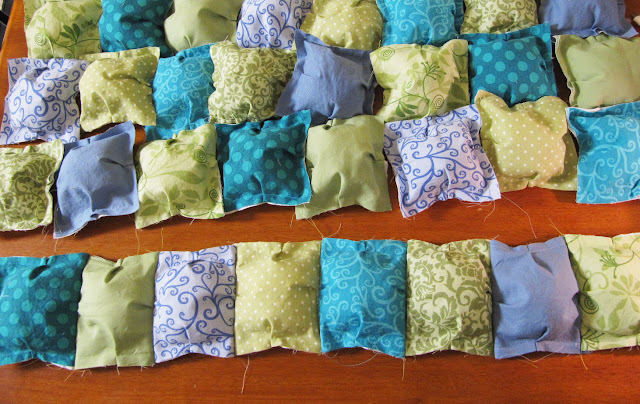 And another great thing, is that Heidi has a blog here, where she shows you how to make your very own puff quilt, if you’d rather tackle it yourself. She split it up into several parts: part 1, part 2, part 3, and part 4. 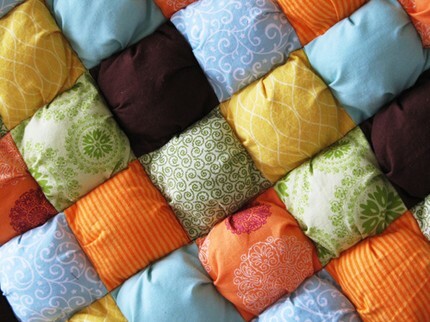 What a great project for using up those scraps. Yeah, we’ve all got the stash. 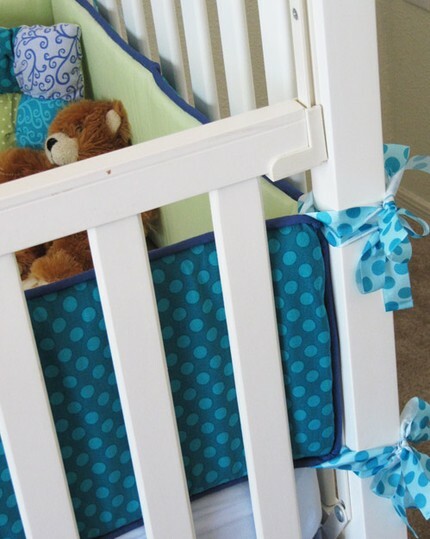 And she also creates coordinating crib skirts, valances, crib sheets, and changing pad covers. You let her know the size and color…….and Heidi does the rest to help you create a beautiful and unique nursery for your little one. 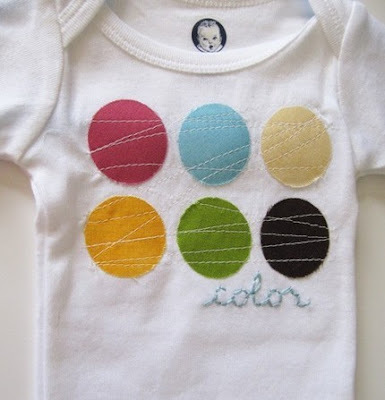 Okay, and I just have to mention her sweet little onesies that are all made so lovingly. 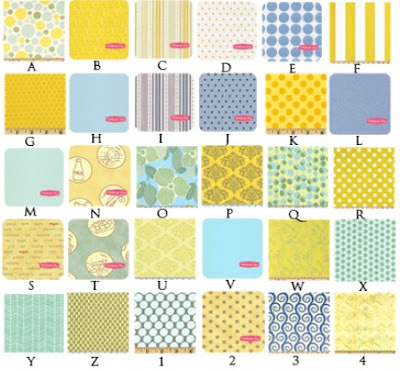 The designs, the colors, the variety……..I love them all. Don’t you just adore everything in that little Honeybear Lane shop? And as a sidenote, Honeybear Lane is having its 1-year anniversary coming up, so be sure to check in at the shop from August 13th-20th for some great sales. And Heidi has made a goal of coming out with at least one new quilt design per month, so be sure to check back often. Well, Heidi has decided to do a giveaway right here for all of you. 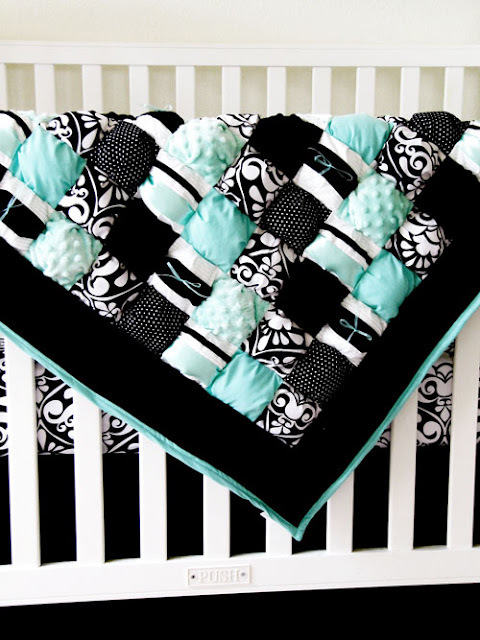 She has generously decided to giveaway one of her Luxurious Damask Puff Quilts, valued at $140. This blanket is extra luxurious. Many of the puffs on this quilt have satin and velvet ribbons, some of the puffs are made from that super soft minky fabric, and the rest are cotton fabric……all specially chosen to coordinate with this quilt. The entire backside is that same incredibly soft minky fabric with the raised dots. What a great way to spruce up that little nursery. And if you don’t have a nursery yourself, can you imagine what a great baby gift this would be for a dear friend? Entering this giveaway will be a bit different, so please read carefully how to enter. Visit Honeybear Lane here, and browse around for a bit and choose your very favorite item over in the shop. Then come back and let me know what you like, in one comment. Be sure to leave your email address so that I can contact you if you’ve won. Check out the Honeybear Lane blog found here and become a follower of the blog. (The “follow” list is on the right sidebar…..scroll down a bit.) Then come back here and leave another comment, telling me that you are now a follower of Heidi’s blog. 2 entries for this giveaways……because it never hurts to increase your chances, right? I love everything she has! The apron skirts are probably one of my favorites. I love the blankets and that you can get a coordinating pillow. I'd love her to make a custom set for our nursery when we get pg. I like the Look Who's Here onesie. I love everything… so cute, I just want to grab it all for my little girl. BUt I still think my favorite is the blanket that she is giving away!!! BEAUTIFUL!!! I would love to do a nursery in those colors! I love the blankets and the adorable chocolate leggings! They would be so cute under one of those cute party skirts!!! I also started following her blog. I love that she shows you how she does it. 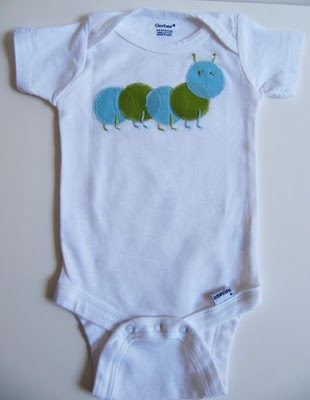 I love the caterpillar onsie! My little boy loves 'The Very HUngry Caterpillar' and we are going all out for his birthday. That would be the perfect outfit! I LOVE the damask blanket that you posted. Beautiful! And… I love the Rylee Apron Skirt. That is so dang cute! What a great giveaway. I love love love her puff blankets. The one with the orange/browm/blue/green would go nicely with my son's nursery. We're currently trying to complete it because he's already 6 months and he needs his own room now. What an original concept! I love them! 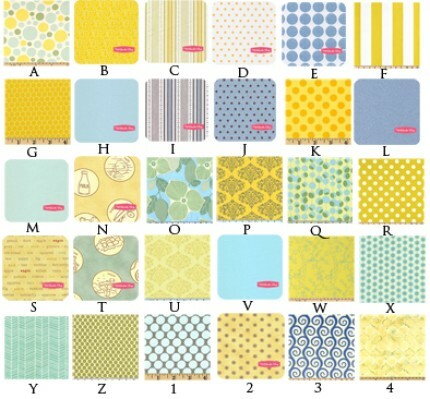 I'd have a custom puff quilt done in yellows and greys. Following her blog via Google Reader. Such cute things! I love all of the cute owl shirts! The pink owl tank is adorable! I absolutely adore the izzie party skirt! all of the quilts are beautiful as well! O.k., those puff quilts are just amazing. I'm loving the apron skirts too! i'm a follower now. thanks for introducing her to me. 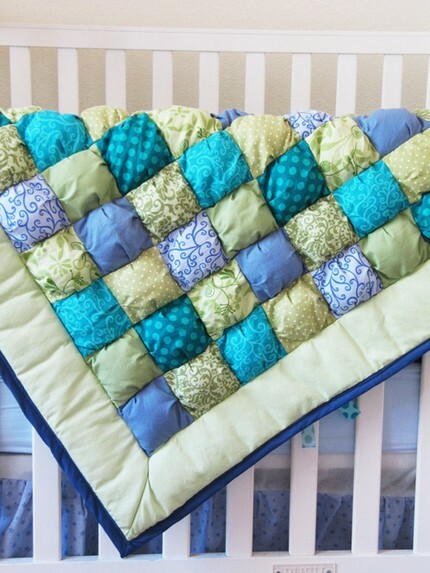 love the aqua and lime green blanket. I cant imagine the time that goes into making those! I LOVE the damask one in the giveaway! 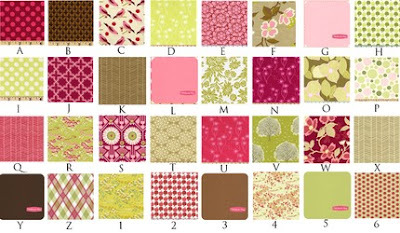 Damask is my favorite!!!! I am follower of her blog! I am now a follower… love all the tutorials she has on her blog.. maybe some day I will actually try it myself. I ironically enough LOVE the quilt the best! I just love it's puffy goodness, and I have a friend who's a little discouraged with her new baby space, this would be the icing on the cake to make her feel like it's as special as it could ever be! I love that quilt!!! Those are my fave on her site! Those blankets are all soo so adorable! I love how all of the squares are different fabric. I also love the peony flower headband. Oh my goodness! I soooo love her store! I love the puff blankets but ALSO the big flower headbands! I am already a facebook fan and follow HoneyBear Lane blog, it is one of my daily blog stops!!!! 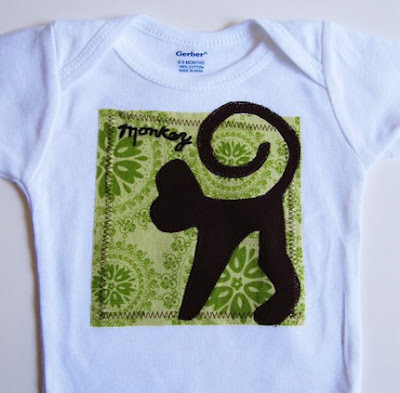 I also have used her templates and made my own onesies for my son! The quilts are definitely my favorite. Those quilts are to die for! I also think the IZZIE Party Skirt is super cute. I am a follower of your blog also. All of the skirts are to die for! The Rylee one is adorable. And I love the quilts, so beautiful and unique. I love it all! Haha. Really, my absolute favorite is the blanket in the giveaway, but I also love the apron skirt! Such cute things! I love all the blankets! The crib sets are amazing, but I truly love the Back in Black Applique Onesie (guitar style). I like the tie-dye feel it has. What beautiful work she does. I love the Pretty Petals onesie. There are so many beautiful things in her shop, but the "Whoos here now" owl onesie is definitely my favorite. I've started following her blog with Google Reader. I'm a new follower of her's! She's so crafty! Great site! I'm in love with the pastel blues and yellows! She does some amazing stuff! THe Luxurious Damask Puff Quilt is my favorite! So cute!!! My favorite is the Luxurious Damask Puff Quilt! I am also a follower of the homey bear land blog…. Oh that blanket is beautiful! I have to say, I think the Brooklyn Apron skirt is gorgeous! So funny that you would post this today! I actually convo'd her on Etsy yesterday and ordered this EXACT quilt (only bigger)for my new little girls nursery. Heidi seems like a total sweetheart! I'd love to have a smaller version of the quilt for 'on the go'. And I'm now a blog follower! I love the puff blankets! I am so excited that is what is being given away! Officially following! Such cute stuff! i think the color onesie and little creeper onseie, are just too cute! I rather like the brown/orange puff blanket. Fall colors are my absolute favorite! I love the Rylee apron skirt. It would look adorable on my little girl. That quilt is amazing! I also love her "apron skirts"! those aprons are to die for!!! Definitely love the pretty petals onesie! That little flower is so delicate, perfect for my little girl. I adore the "Look Hoo's Here" owl onesie…I'm infatuated with owls! I became a follower. This blog is so cute! 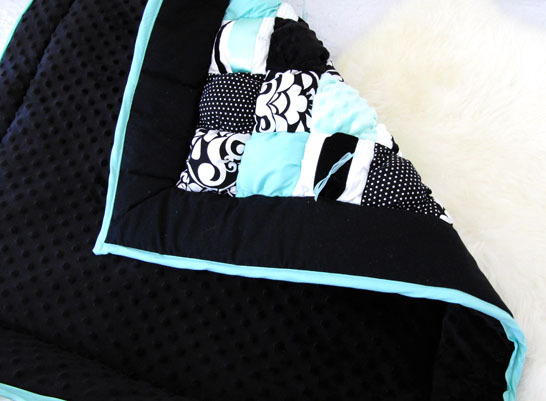 My favorite item by far is hte blanket (Luxurious Damask Puff Quilt) she is giving away! It is just AMAZING!!!! I'm a follower for Honeybear Lane – what a fantastic blog! Actually, my favorite item is the blanket up for giveaway.. I'm a HUGE fan of black and white and this one with the added color pop is just AMAZING!! Other than that blanket I love the little rock onesie with the guitar since we're hoping for a boy (find out in 5 days) and my husband is all about music and playing his guitar! I would so want a quilt / blanket. As a photographer I am always looking for ways to spruce up the pictures and this would be perfect for newborn shoots!! I love everything… LOVE the quilt she's giving away, and also the skirts and onesies with appliques- the color one is so cute. I'm also a follower of her blog now… can you tell I want that adorable quilt real BAD?!? I love the skirts! And the flower headbands and…. Oh all of her stuff! Follow her blog now!! can't wait to see more of her stuff. Really hope I win, this would be awesome. I am also a follower of her Honeybear blog now! I follower her honeybear lane blog! I follow her blog and FB now! I love the Izzie party skirt!